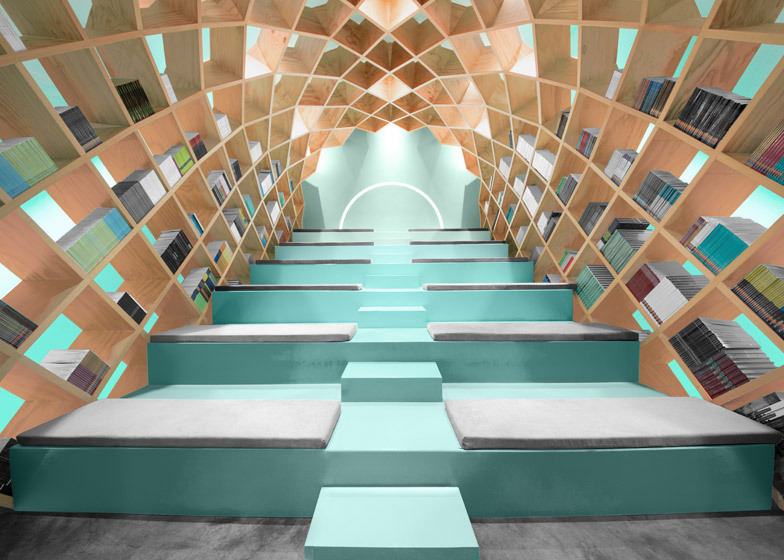 Mexican firm Anagrama has installed a dome of interlocking wood panels at a library in Monterrey, creating bookshelves that arch over a stepped reading area (+ slideshow). 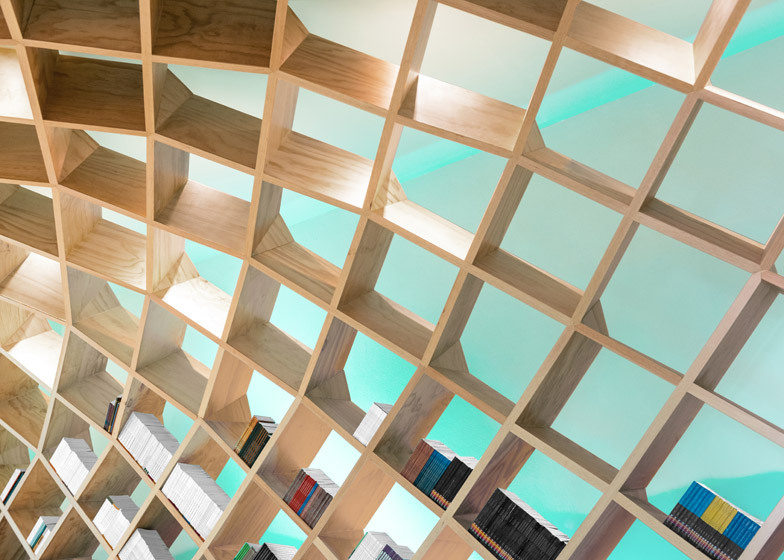 Anagrama added the structure to the small Biblioteca Conarte, which is located inside a heritage building in the Mexican city. 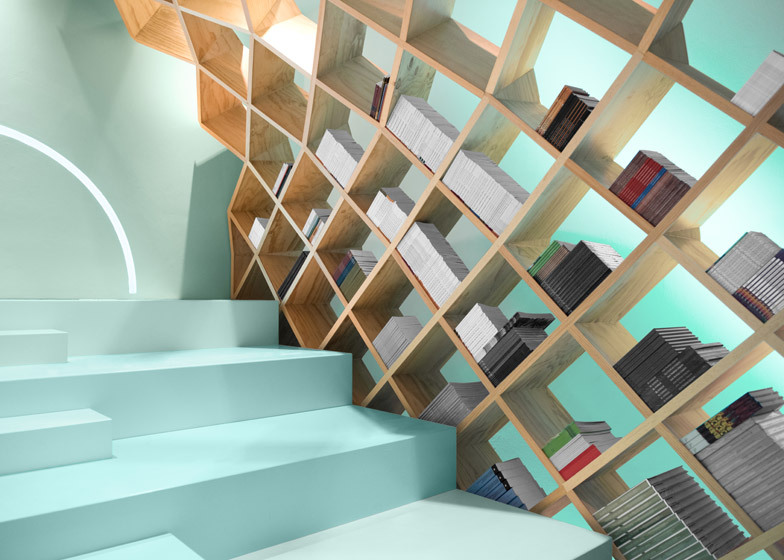 Its angled compartments form shelves for storing books along its two sides, which join at the top to create an arch over a staircase. 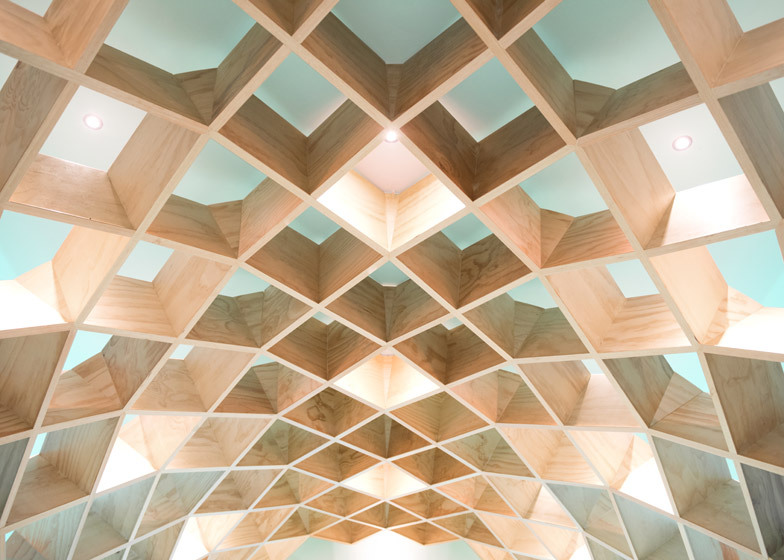 "You have to walk your way up until you find a book that you like, and then you just sit there and relax," Roberto Treviño, Anagrama's architectural director, told Dezeen. The flight has smaller stairs up the middle for walking on, while larger bleacher-style steps that can be used as seats are located on either side. 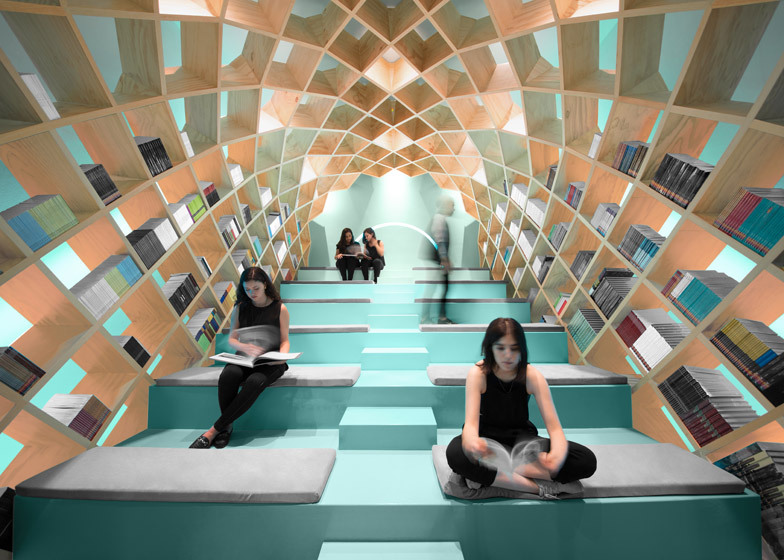 This type of seating, commonly found in sports arenas, has also been used at a bookshop in Bratislava and a house in South Korea to provide places to read. At Biblioteca Conarte, grey cushions are provided on the steps to make the reading area more comfortable. Both the stairs and the surfaces behind the wooden grid are painted a light turquoise colour, chosen to contrast with the wood. 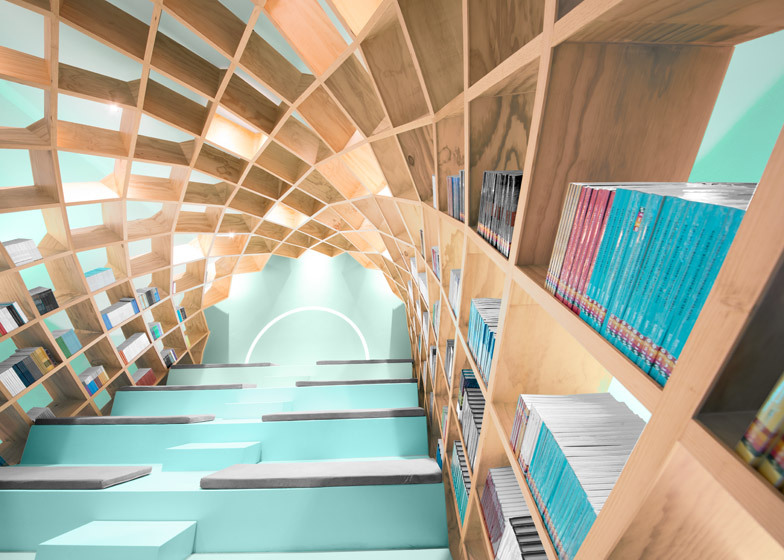 "We didn't want the readers or visitors to feel inside a traditional library, so we designed this almost surreal wooden structure with gradated cyan paint on the middle platform," said Treviño. The steps lead up to a illuminated semi-circle that "simulates the vanishing point of the structure", according to Anagrama. A subtle change in the colour gradient across the surfaces also contributes a sense of depth and perspective to the space. 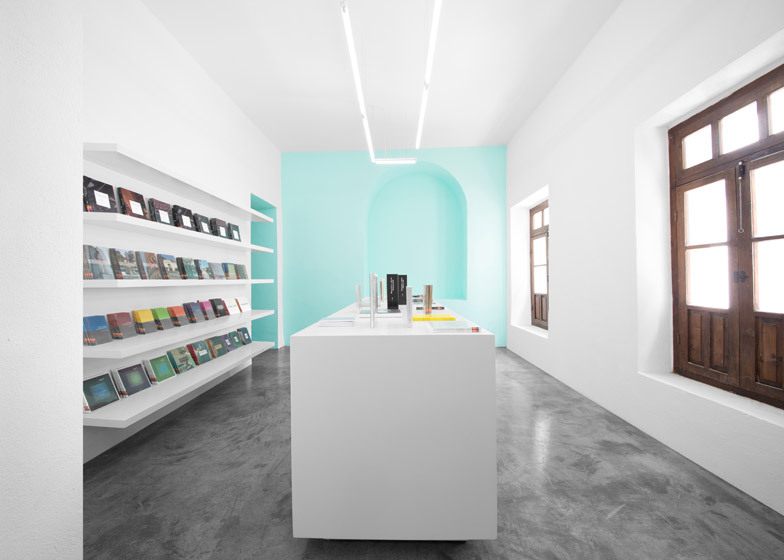 The turquoise colour continues onto one wall of an adjacent room, which is otherwise painted white and serves as a bookshop. Volumes can be found on wall-mounted shells and on a central storage island in the middle of the concrete floor. Original windows framed with dark wood allow natural light into this space, while the room that hosts the gridshell is lit artificially. 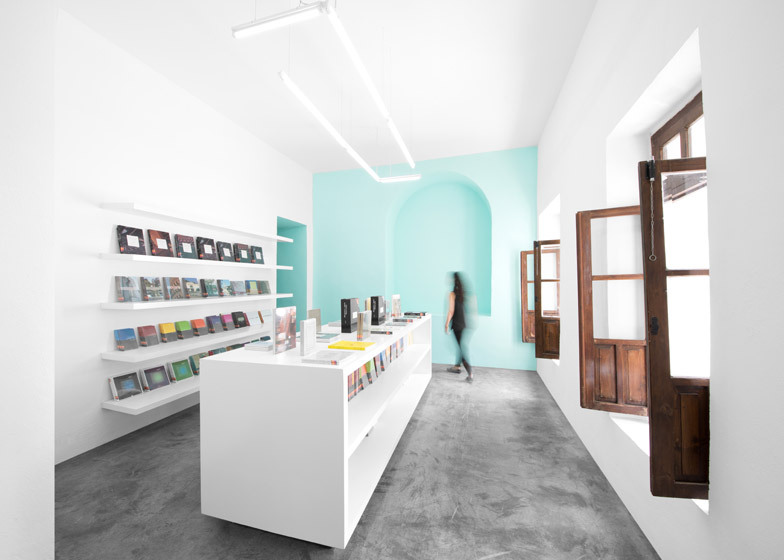 "There is a transition from this very old building into a minimal bookstore, which gives away just a little taste of what's inside with this cyan-painted wall, then into this whole new world with no communication with the exterior," Treviño said. "It really creates an amazing reading experience." The project was commissioned by Conarte – the council for culture and art in Monterrey, which aims to "promote and stimulate artistic expression". 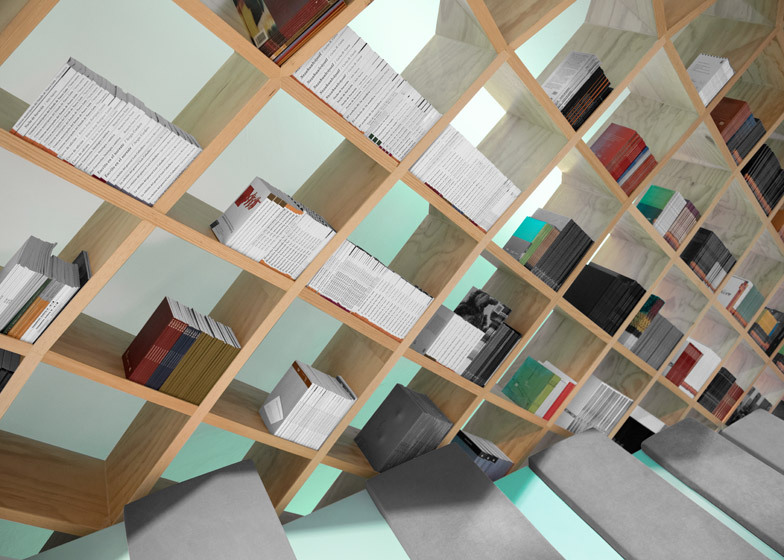 Anagrama also collaborated with Conarte in 2013 to design a children's library in an empty warehouse in Fundidora Park in Monterrey, again featuring unusual geometrically arranged shelves. The firm, which offers branding and architectural services, has previously installed a giant bead maze inside a children's clothing store and designed a shop dedicated to French macarons.